Read the best content. Bali and Karma Group wait for you! Take a look at the Jimbaran contests. Bali’s luxurious Karma resort. 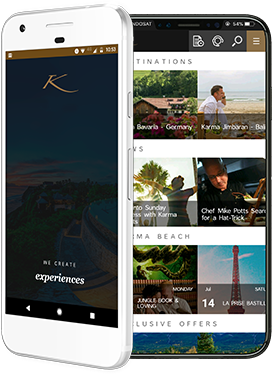 The Karma Group shares the most remarkable contest in Bali, and Karma Jimbaran is one of the beautiful resorts which are featured. From the spectacular location to the fully equipped villas with private gardens and pools, the Karma Jimbaran is a resort where you will create unforgettable memories. See the videos that capture the magic. Make a reservation in the Karma Jimbaran and make your vacation luxurious and special! The cuisine at the Karma Lounge is scrumptious, made from organic, locally produced ingredients enriched with spices and herbs. The view from the terrace is something you will never forget. You can enjoy a traditional Balinese special while you enjoy the sunset and the ocean breeze. The accommodation is luxurious, and the staff is friendly and professional. We feature a gym, a library, and a kids club. Our concierge service is available to you 24/7 for tips about local sightseeing. You can find the best contest in Bali right here in the Karma Jimbaran resort. Karma offers to win a voucher. Bali is the best place for a lavish vacation. Karma Kandara is the jewel in the Billionaire’s Row, lavish, secluded and yet within walking distance of the famous attractions. The Uluwatu Temple and the 18-hole golf course are less than 20 minutes away. The resort is perfect for golfers. You can enjoy the game and at the same time stay in a 5-star lodging, we even provide special packages. Take a look at the Karma Group offers to win voucher Bali. The Karma Kandara will take care of your every need. We have a gym if you want to work out, restaurant, bar, and club on-site. We feature a kids club and a spectacular spa. If you want to know more take a look at the contest in Bali, and see the oasis we created. Book your villa today in the tranquil and luxurious Karma Kandara! Presenter was excellent, the presentation was very interesting, a worthwhile investment in future holidays. What a delightful consultant, she was very informative, really good concept, hopefully sometime in the future. A great idea and investment and a big thank you to Maxi found him a down to earth person and he was major in this decision for me. ` }) gridTemp += "
` } gridTemp += "